In January, shortly after Jeremy Tyler signed with the Knicks and around the same time he let me do an interview with him, Jeremy’s first child was born 3 months premature. Jeremy’s son, Jeremy Junior, spent months in the hospital fighting for his life, but, fortunately, was allowed to come home to Jeremy and his girlfriend Sukey. On Saturday, Jeremy will be hosting “A Night of Awareness” to benefit Hailey’s Hope Foundation, a charity that supports families with critically ill babies in the New York area. HHF reaches out to families in the Neonatal Intensive Care Unit, helping pay non-medical costs such as gas, lodging, and meals, and by offering care packages, calling in and checking up on families, educating parents, working with doctors and nurses, and funding clinical research. Jeremy is hosting this event to bring awareness to the foundation and the alarming number of premature babies being born every day. 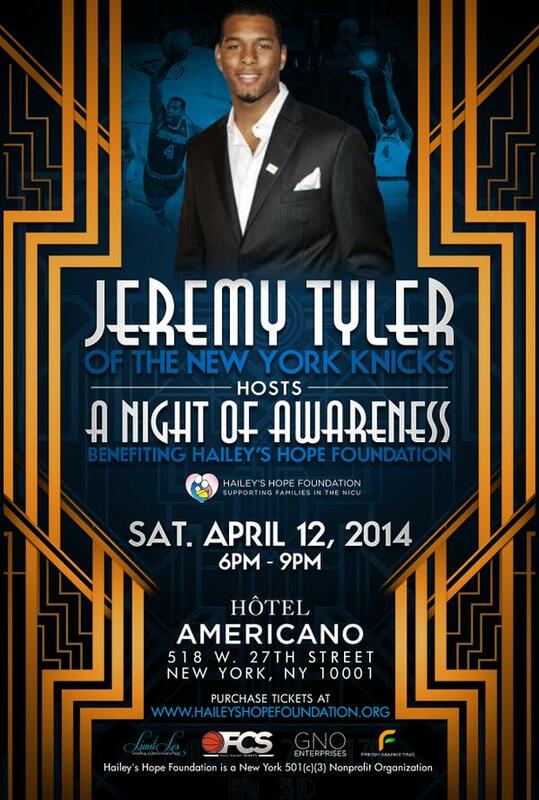 Experience an unforgettable evening with Jeremy Tyler of the New York Knicks and his NBA friends to benefit Hailey’s Hope Foundation. Join them as they celebrate and raise money for Hailey’s Hope Foundation’s programs that support premature and critically ill babies and their families in New York-area Neonatal Intensive Care Units (NICUs). Jeremy Tyler will share his personal journey and connection to the cause and honor Hailey’s Hope Foundation’s leaders. Guests will enjoy a buffet-style dinner, music, great auctions and more. Tickets are $40 each (cash bar) and can be purchased at the link below. 8pm-9pm – Introduce Jeremy, personal connection to charity, share his story introduce teammates, high-profile guests and thank everyone for coming. After 9pm – We will have a DJ performing, open format, but that will not be affiliated with Hailey’s Hope program. Help support Jeremy and this great charity! And check out the interview we did with Jeremy back in January! This entry was posted in Articles and tagged haileys hope foundation, jeremy tyler, jeremy tyler charity, jeremy tyler knicks, KNICKS, knicks charities, KNICKS MEMES, Knicks news, nba on April 10, 2014 by Tommy Rothman. New York Knicks Memes is a fan page and in some ways a parody site. As we are a fan page, we are in NO way affiliated with the New York Knicks or Madison Square Garden. As we are in some ways a parody page, information presented on the site may not be factual (but you will be able to tell when we are joking). All rights reserved (whatever that means). Enter your email address to follow Knicks Memes and receive new posts by email.